Jordan Peele’s Us has more jump scares than Get Out, which means more of me hiding behind my hands and gripping my armrest. And most of the movie’s unnerving moments come before all its typical horror sequences: Adelaide Wilson (Lupita Nyong’o) teaches her son Jason to snap off rhythm to “I Got 5 on It.” Elisabeth Moss, that white friend, announces the current time as “vodka o’clock.” (A dubious proposition, and I’m speaking from experience.) Us is a movie about family vacations — in general an extremely concerning setting — so by the time four people that look exactly like the Wilsons shows up at the foot of their driveway wielding the kind of scissors that belong in a deeply wicked Brothers Grimm fairy tale, audiences have already been given plenty of reasons to cower. But when I first saw the “tethered” doppelgängers, I wasn’t just scared, I was repulsed by their presence. “Red jumpsuits … gloves … sandals… no brows …” I scribbled in my notebook, home to all the important observations I make while watching movies (like “bury me inside of one of Sam Elliott’s neck wrinkles!”). Peele’s camera milks our first close-up of the tethered, zooming in on their matching outfits and blank stares. Red makes the introduction, doing her very best Robert F. Kennedy impression. “We’re humans too, exactly like you,” she says, explaining the netherworld from whence she and her family came, populated by, essentially, everyone’s evil twin. These aren’t geeky Tevas, or obnoxious Jesus sandals, both signaling very specific potential misdeeds (a hike or an hour of mansplaining, respectively). Nor are they the particular variety of footwear that can only be called “grilling sandals”; the kind of shoe worn by the black uncle manning the barbecue at the family cookout. The Wilsons’ “tethered” twins are sporting the kind of shoes one wears when they don’t care what they’re wearing: flat, tan, and with straps. Not espadrilles, not quite Roman sandals. At least one pair (Duke’s) looks like it has an ergonomic sole. Us has a lot of chilling fight scenes, but nothing can compare to the sheer terror inspired by these sandals. They are simply the most frighteningly foul things I have ever seen. Who lives like this? Where could they come from? Wouldn’t sneakers, ostensibly, be the better shoes for wreaking havoc? 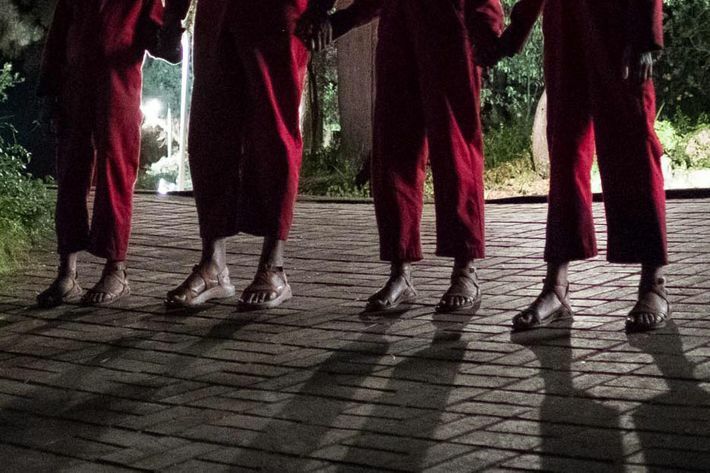 It’s not just that the sandals are ugly — although they are, and I do believe that everyone’s toes should be covered at all times — or even that they’re an absurd detail for the movie to double down on, like going barefoot in A Quiet Place. There’s a deeply unsettling quality about this family’s uniformity. The family that prays together stays together, I guess. But the family that matches has arrived for one purpose: murder. According to Us’s costume designer Kym Barrett, the choice to dress the tethered in these very sandals (designed for the movie, and unavailable for purchase you murderous nerds!) was intentional, as was the rest of their outfitting. “We decided quite quickly that we needed to give the tethered the same silhouettes as their above-ground counterparts,” Barrett told Vulture. The coveralls were utilitarian and plain, and seemed like a realistic and achievable uniform for a global alliance of knockoffs. Maybe what makes the sandals so horrifying is the suggestion that they were a calculated choice. The tethered didn’t show up in tattered hand-me-downs, they wore jumpsuits; they’re not wearing white nurse sneakers, they’re wearing anti-Jesus sandals. Not only is a regular family hunted by their evil doppelgängers in Us, the doppelgängers arrived with a plan so thorough it involved matching down to the footwear. It takes me like eight texts to secure a dinner plan. Sometimes 30 emails to get on the phone with one B-list celebrity. How many emails did it take the evil tethered to show up to the function in matching sandals? Please don’t tell me. I have no business knowing. As Us chugs along, we meet the family tethered to the Wilsons’ friends, Kitty and Josh (Moss and Tim Heidecker) and their two twin daughters. This family is considerably less adept at fighting off their twin foes, losing father Josh and the Tyler girls almost instantly. (Kitty survives a little longer because she’s Elisabeth Moss, dammit!) The Wilsons unknowingly head to the Tyler house for refuge, only to realize their white friends are victims of a netherworld uprising, too. Both the real Wilsons and the tethered Tylers scatter throughout the property. That’s when Josh’s double, Tex, chases after Adelaide’s husband, down the pathway, toward the dock. The camera pans down Tex’s body, landing on his most chilling detail: Past the same red coveralls and the same grim scissors, the tethered Tylers are wearing the same weirdo sandals! I can deal with the scissors and the stalking, and I can even deal with the bunnies. Lupita Nyong’o-as-Red’s voice? Yes, I can stand that too, but barely. These sandals, however? Not on my watch. The sandals are, quite terrifyingly, this movie’s thing.